Having biscuits in the freezer ready to bake is one of my “convenience foods”. They come out fluffy and delicious like you just mixed them up and baked right away. In a large bowl, sir together the flour, baking powder & salt. Using a pastry blender, cut in butter until crumbly. Add the milk all at once. Use a fork to stir just until moistened. Turn the dough out onto a lightly floured surface. Knead dough by gently for 10-12 strokes, or until almost smooth. Pat dough out until 1/2 inch thick. Cut dough using a biscuit cutter or you can use a glass dipped in flour to cut the biscuits. At this point, you can bake right away at 450* for about 10 minutes on an ungreased cookie sheet. To freeze, place biscuits on cookie sheet and place into freezer until frozen. When frozen, remove from pan and place into freezer bags or container. Return to freezer. I also place the unfrozen biscuits in a freezer container, placing wax paper between layers. Which ever way you choose, when your ready to bake, you can pull out the number that you need. 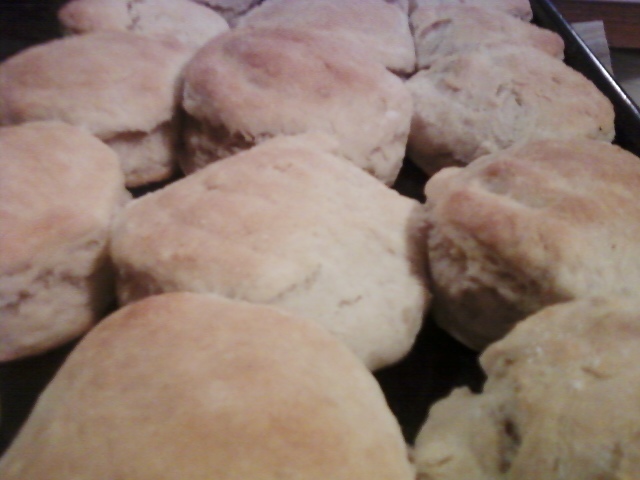 Bake frozen biscuits on an ungreased baking sheet at 450* for about 12 minutes, or until golden brown. I usually get about 40 biscuits from this recipe. The number will vary, depending on how thick you make the dough.